Ray's Bucktown B&B Innformer: Do Division! And do other things too! 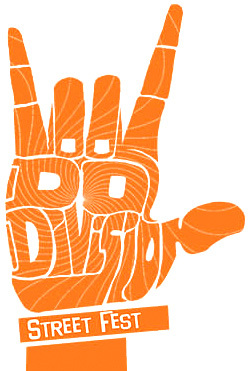 Do Division! And do other things too! It's finally here, the first really big street festival of the season, and just down the way from Ray's Bucktown Bed and Breakfast at that! Do Division has some of the best early-summer street food, plenty of vendors and trinkets, and not to mention some pretty good music. Here at Ray's we have a few favorite Festival bands, and while not everybody we like will be making an appearance you do have neighborhood staples Subterranean and Empty Bottle organizing the lineup so we doubt you will be disappointed. While you are groovin' check out some of the vendors. Above is last year's booth for Fair Earth - a small business focused on high quality, eco-minded, fair trade jewelry, accessories, and randomly delightful artifacts. If you have the chance stop in and chat, a few employees did a photo shoot with her last summer and she is quite an inspiration. If you also want to know who else will be there, what to nosh on and drink, etc check out the event's facebook page for more info. Since the weather is finally pretty solidly nice for the next few days it would be a great time to take advantage of all the architectural tours and river cruises the city has to offer, our favorite is the longstanding standard, put on by the Architecture Foundation of Chicago. Not feeling the outdoorsy spirit? Here's a list of even more cool stuff going on this week - indie short film festival, fashion events, and more!